July 6, 2016 update — The full study by Hall and colleagues was published today in American Journal of Clinical Nutrition. This final version continues to downplay remarkable findings for a limited pilot: a significant increase in metabolism on a very-low-carbohydrate diet. Evidence continues to accumulate (even from skeptics) that all calories are not alike to the body! IN JANUARY, the neuroscientist Stephen Guyenet claimed to have refuted the Carbohydrate-Insulin Model (CIM) of obesity in an article published on his Whole Health Source blog. I responded to Guyenet, arguing that each of his 11 criticisms was based on a misunderstanding of the biology and neglect of much relevant research. This month, CIM came under attacked again, this time by National Institutes of Health researcher Kevin Hall, who claimed in a widely circulated YouTube video to have “falsified” the concept. His evidence: a small, short-term, non-randomized pilot study that he presented in abstract form at the 2016 World Obesity Federation meeting. Before examining the deficiencies of Hall’s pilot study, I’ll review some of the more concerning problems with the conventional Calories In, Calories Out view of obesity, and the extensive evidence in support of CIM. According to the conventional view, obesity results from a simple mismatch between calorie intake and calorie expenditure. In our modern environment with ubiquitous tasty food and inadequate opportunities for physical activity, it’s easy to consume more calories than we can burn off. So this excess — calorie-rich substances like glucose and free fatty acids — accumulates in the blood stream and ultimately gets stored in fat tissue, leading to weight gain. The solution: just eat less and move more. But the Calories In, Calories Out model has a sort of Emperor’s New Clothing problem, evidently unseen by its advocates. Without advanced technology, not even the most expert nutritionist could accurately assess an individual’s energy balance to within 350 calories a day by assessment of diet and physical activity level. A daily overestimate 1/10th that magnitude would cause obesity in a decade. For that matter, if conscious control of calorie balance were so critical to weight control, how did humans ever manage to prevent extreme fluctuations in body weight before the very notion of the calorie was embraced a century ago? More fundamentally, this approach disregards decades of research demonstrating that body weight is controlled more by biology than will power over the long-term. With calorie deprivation, the body fights back in predictable ways — including increasing hunger, slowing metabolism, and secretion of stress hormones. These hallmarks of the starvation response make long-term weight loss by calorie restriction exceeding difficult to maintain. Indeed, only a small proportion of the US population has ever maintained even a moderate weight loss for just 1 year. Are we destined by genes or environment to inexorable weight gain? Must we choose between lifelong obesity or ceaseless struggle with hunger? Is bariatric surgery our only long-term solution? CIM answers a resounding no, no, and no. What is the Carbohydrate-Insulin Model? According to a radically different way of thinking, excessive weight gain occurs because fat cells have been triggered to take up and store too many calories, leaving too few for the rest of the body. We overeat in an effort to keep enough calories in the blood stream for the brain, muscles and other vital organs, but those extra calories ultimately wind up in fat cells, creating a vicious cycle of hunger, overeating and weight gain. In other words, overeating is a consequence, not the cause, of an underlying metabolic problem. Consider what happens in pregnancy. The mother’s increased hunger and food intake doesn’t make the fetus grow; the calorie demand of the growing fetus makes the mother hungry and eat more. CIM says the same thing happens to those whose fat tissue is being stimulated to grow. We typically consider obesity a state of excess, but from this perspective, the problem is more akin to starvation, explaining why hunger increases and metabolism slows on a conventional diet long before normal body weight is anywhere in sight. Thus, calorie restriction amounts to nothing more than symptomatic treatment, destined to fail over the long-term for all but the most exceptionally disciplined among us. So what’s triggered fat cells into calorie storage overdrive? The obvious answer is too much of the hormone insulin, which we can think of as Miracle Gro for fat cells. And what’s raised insulin levels? That’s just Endocrinology 101: all the fast-digesting, processed carbohydrates that flooded into our diet during the low-fat craze of the last 40 years — white bread, white rice, prepared breakfast cereals, potato products, crackers, cookies, and of course concentrated sugar and sugary beverages. — Insulin administration in experimental animals, or insulin therapy in people with diabetes, predictably causes weight gain, whereas insulin deficiency invariably causes weight loss. 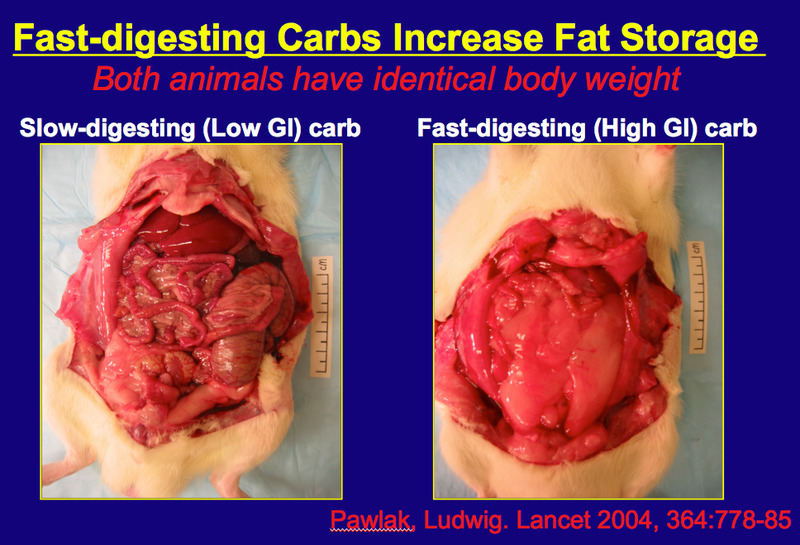 — Animals given fast versus slow digesting carbohydrate take in more calories than they expend and gain excessive weight. When their food intake is restricted to prevent weight gain, their metabolism slows down and they still accumulate a relative excess of fat tissue (see figure). This finding completely defies the Calories In, Calories Out view of obesity. — In humans, the number of calories in the blood crashes, stress hormones surge, and hunger increases a few hours after meals with fast-digesting carbohydrate compared to meals with slowly-digesting carbohydrate or less total carbohydrate. — The highest quality clinical trials — those that actually produce significant differences in diet among the groups — show a substantial advantage of higher-fat diets compared to lower-fat diets. Several systematic reviews confirm this point (the opposite of what would be predicted by a calorie-focused approach to weight loss, since fat has more than twice the calories per gram than the other major nutrients). — The benefits of higher-fat/lower-carbohydrate diets extend beyond metabolism, to include chronic disease risk reduction. Among the best prospective observational studies, calorie-dense, high-fat foods (like nuts, olive oil and dark chocolate) seem to protect against diabetes and heart disease, whereas fast-digesting carbohydrates (potato products, refined grains, sugary foods) increase risk. That’s also the upshot of two recent major clinical trials. The Look Ahead Study showed no benefit of a low-fat diet on cardiovascular disease (and closed early for “futility”). In contrast, the PREDIMED study demonstrated major reductions in cardiovascular disease on higher-fat diets with lots of nuts or olive oil (and also closed early, but in this case because the effect was unexpectedly large). Hall and his collaborators aimed to test the hypothesis that exchanging “dietary carbohydrate for fat . . . [will] increase energy expenditure and fat oxidation.” They admitted 17 men with high body weight to a metabolic ward for 8 weeks, during which the participants ate two controlled diets: high carbohydrate (50%) for the first 4 weeks followed by a very-low-carbohydrate (5%) for the next 4 weeks. Throughout the study, the investigators measured how many calories and how much fat were burned on a daily basis. During his poster session, Hall was asked whether carbohydrate restriction could affect calorie expenditure. He replied that his study “basically answers the question . . . no,” and “falsifies” CIM. The full details of the study have yet to be published in a peer-reviewed journal, but we have enough information about study design to dismiss Hall’s conclusion with confidence. 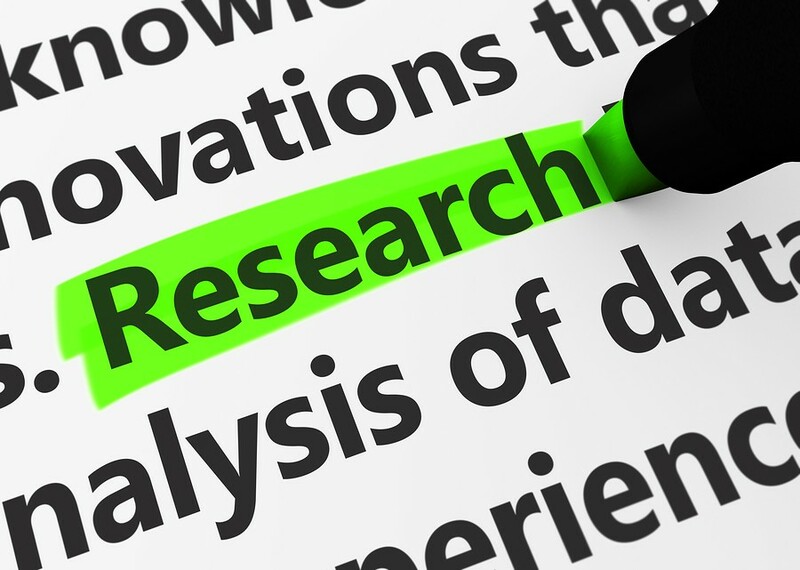 Prior to recruiting participants for clinical trials, investigators are generally required to specify basic design details in an official registry. Hall’s registry calls the project a pilot — the term used to describe “a small scale preliminary study conducted in order to evaluate feasibility, time, cost, adverse events, and effect size . . . and improve upon the study design prior to performance of a full-scale research project.” In other words, pilots are recognized in advance to have such major design weaknesses as to virtually preclude definitive outcomes. Beyond its small size and short duration, Hall’s study suffers from at least one first-order flaw — the two diets were not given in randomized sequence. Thus, the study is best considered observational in nature, a term that was explicitly used in the registry. As any introductory course in study design would make clear, small observational studies are subject to myriad influences that may confuse, obscure or exaggerate apparent relationships (a problem called confounding). Any factor that changes with time — in this case related to participants biology, treatments, environmental conditions or measurements — could bias the data in ways that would make cause and effect impossible to establish. Even without further consideration, we know that the study simply cannot prove or disprove CIM. Furthermore, with the limited available information, we have reason to suspect that the data are strongly biased against the very-low-carbohydrate diet. Contrary to intention, participants were not in calorie balance, and instead lost weight and fat throughout the study (the cumulative energy deficit was calculated to be more than 16,000 calories). This major flaw would not necessarily be fatal if the diets were given randomly, because then the investigators could statistically control for carry-over effects such as this. But here, participants began the very-low-carbohydrate diet several pounds lighter compared to the high-carbohydrate diet. 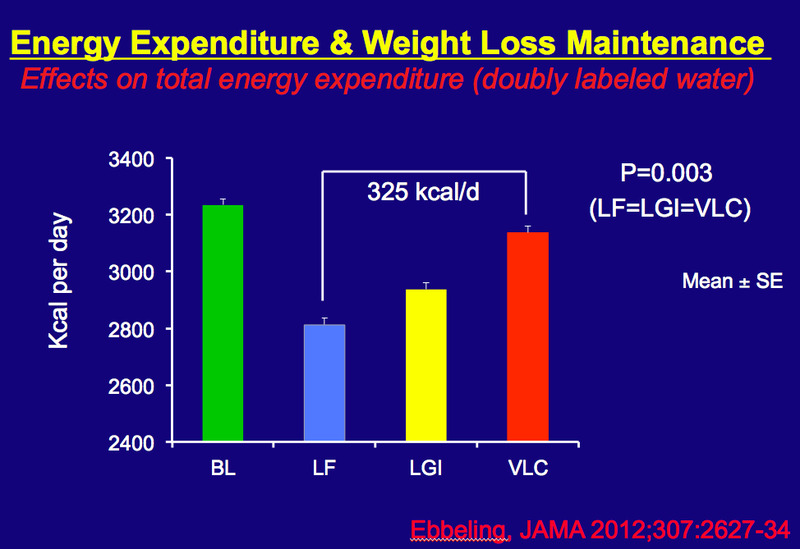 We know that weight loss lowers energy expenditure. Quite plausibly, this effect could have been 50 calories or more a day against the very-low-carbohydrate diet. After 4 weeks confined to a research ward and not able to engage in usual levels of physical activity, the participants probably also started the very-low-carbohydrate diet with proportionately less muscle, or muscle that functioned differently. It’s possible this effect also lowered energy expenditure by 50 calories a day. Hall has no way to know. In addition, the investigators did not report calorie loss involving ketones in breath and urine, and fat in the stools. These loses would have been greater on the very-low-carbohydrate (i.e., high fat, ketogenic) diet. Another 50 calories a day? Like some others, you may now be experiencing cognitive dissonance. The results showed that carbohydrate reduction increased energy expenditure as predicted! Beyond expectations for pilot studies, their results were statistically significant. Hall dismisses these results as biologically insignificant, but according to his own calculations, an energy gap of 100 to 150 calories a day would comprise a major component of the obesity epidemic. More importantly, the pilot was not designed to make an accurate determination of the differences between the diets: that any effect was observed at all is remarkable. And as considered above, the study almost certainly underestimated the true effects of the very-low-carbohydrate diet. Using the estimates above to correct for likely bias, the very-low-carbohydrate diet could easily have increased calorie expenditure by 250–300 calories a day or more — in close agreement to the findings my colleagues and I published in JAMA in 2012. Hall further argues that the way calorie and fat oxidation changed during the 4-week periods rules out a meaningful long-term effect — but that inference wildly overreaches the data. We simply have no idea what the true relationships over time would be in a study that controlled for major sources of confounding. 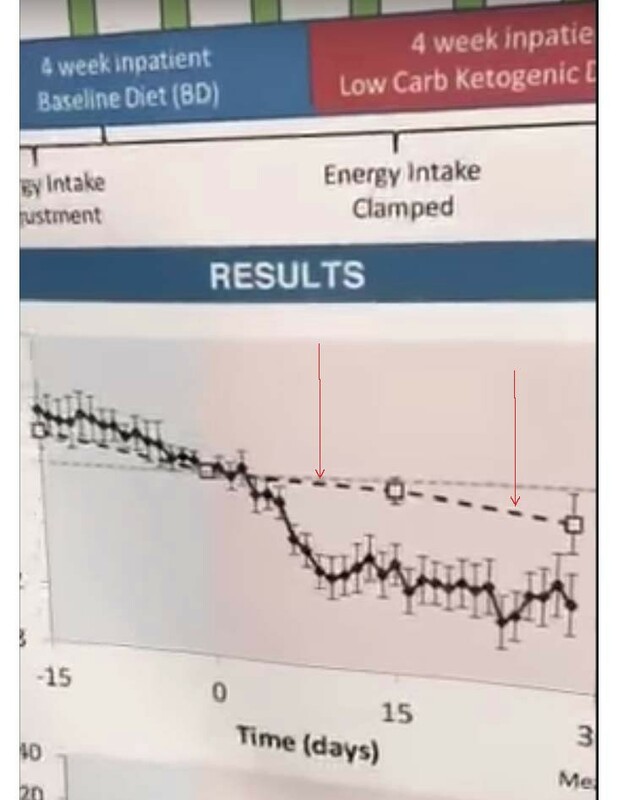 (It’s not surprising that the body fat oxidation decreased transiently on the very-low-carbohydrate diet, as participants habitually consuming a low-fat diet adapted to higher fat intake — see dashed line, left arrow. Although disregarded in his comments, Hall’s data suggest an acceleration in fat oxidation during the second 2 weeks of the high-fat diet — see right arrow). Far from falsifying CIM, Hall’s study supports it. A more accurate summary than the one he gave at the abstract session might be as follows: “We found preliminary evidence for an exceptional effect of a very-low-carbohydrate diet on energy metabolism. This finding suggests that reducing carbohydrate may be advantageous to conventional approaches for weight loss maintenance. Because of fundamental study limitations, these data should be interpreted cautiously pending longer-term, definitive randomized controlled trials.